The decision by the British government to allow their monarch to marry a Catholic is only 400 years or so long in coming. 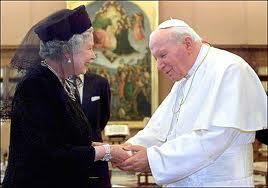 Up until last week's decision the monarch would absolutely lose the throne if a papist was his/her consort. It was a remarkable piece of discrimination that lasted centuries and was originally brought in after Henry V111 dumped the church to create his own. But the monarch himself/herself can never become a Catholic as that conflicts with their role as head of the Church of England. Which really makes England a theocracy more than a monarchy in some ways. It clearly means that the king or queen has to be an Anglican and will lose his/her crown if they decide to suddenly become a Buddhist. Which is outright religious discrimination. And even though they can now marry a Catholic what happens when they have children? The Vatican always seeks for a child of a mixed marriage couple to be brought up a Catholic. Which would of course disqualify that child from ever becoming the king or queen. It could lead too an extraordinary stand off between church and state at some point in the future. Which seems ridiculous in this day and age.